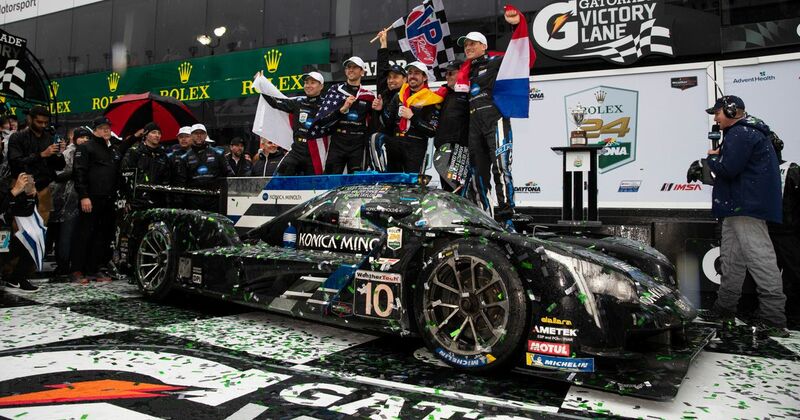 Fernando Alonso wasn’t just one of the winning drivers in this weekend’s Daytona 24 Hours. He was the driver who, it could be argued, won the No.10 Wayne Taylor Racing crew the race. He’s driven many remarkable races in his long career. Even in his short time in endurance racing he’s already been able to make the difference, such as with his superb night stint at Le Mans last year. However, his performance behind the wheel at Daytona was on another level and must surely be up there among the best races he’s ever driven. Here are some of the highlights in numbers. The position Alonso was in when he exited the pits for his first stint, just under two hours into the race. By the time of his first pit stop, he was up to fourth and was soon into the top three. The number of laps it took Alonso to go from third to first. After a great battle with the Acura of Helio Castroneves, he scythed ahead entering the bus stop chicane and set off after leader Rene Rast. Just over a lap later (albeit technically two separate laps later) heading into the first corner, he swooped up the inside of the Mazda to take over the top spot. The number of seconds he pulled on the rest of the field while leading… twice. Once in front, Alonso pulled away at over a second a lap and although other drivers could match him in clean air, it was through traffic where Alonso made up the time. After extending the gap behind him to 20 seconds, a caution period for the stranded No.24 BMW wiped out all his hard work. No worries - when the race went green again, Fernando simply rebuilt the 20-second gap. The number of seconds covering most of the rest of the DPi field while Alonso was out in front. You might attribute the lead he built in the early stages to natural field spread, but the DPi class is a seriously close category. At one point, the gap from Alonso to second place was 13 seconds, while the gap from second to eighth was only 15 seconds. Another early hint that, at times, Fernando was in a class of his own. The position Alonso was in when he started his second stint as the rain began to fall. He was immediately on the pace, going two seconds a lap faster than anyone, and moved up to second in the space of just a couple of laps. A well-timed pit stop followed by a caution period put him in the lead. The number of seconds per lap Alonso started to pull out on the rest of the field once he took the lead. In soaking conditions he put on a masterclass of adaptability, bravery and skill as he left the other drivers trailing in his wake - almost literally, considering the amount of standing water on the circuit. The number of seconds Alonso was ahead of the car in second place after just 35 minutes of racing. Perhaps the most impressive thing about his wet weather speed was that it wasn’t just the odd lap here and there - it was simply relentless pace, lap after lap, regardless of conditions or traffic. He would surely have lapped the entire field had the No.4 Corvette not crashed, triggering a safety car and wiping out his lead. The position Alonso was in at the end of the race when he was calling for a safety car. It’s common for whoever is in the lead in bad conditions to ask for a stoppage, but the track was so wet that Fernando was calling for the race to be neutralised despite running second - risking losing the race in the process. Had race control heeded his words just a few minutes sooner, the No.10 car wouldn’t have won. The number of other drivers who won the race with Alonso. Yes, Fernando was mightily impressive, but so were his teammates, and they deserve a whole heap of credit. Kamui Kobayashi was frequently the fastest driver on the track during his night stint (and set the car’s fastest lap of the race), Renger van der Zande recovered from fourth to first after losing out through caution periods, and Jordan Taylor fought hard to retain the lead and build a gap during one of the wettest stages of the race - and also had to dodge potential accidents. The number of drivers who gave the No.10 crew a seriously hard time and could easily have won the race for their team. Former Sauber driver Felipe Nasr set the overall fastest lap of the race, took the lead from Jordan Taylor late on, and seemed to be the only person able to match Alonso in the wet. He held the lead in the closing stages and fought off Fernando for several laps before succumbing to the pressure - Nasr ran wide at the first corner and lost the position. 10 minutes later, the race was stopped for good. So close and yet so far, but a drive for Nasr to be proud of nonetheless.